Saturday, April 4th was International Day for Mine Awareness and Assistance in Mine Action. Global Currents would like to take this opportunity to talk about the history of land mines and current issues and efforts surrounding mines and explosive hazards. When wars end, often the death and destruction lingers for decades in the form of unexploded land mines and other types of explosives. The people living in affected areas must deal with the effects of these remnants of war, which still kill or injure around 11 people each day around the world, despite massive worldwide efforts since 1997 to eliminate them. In addition to death and injury, the cost of medical care, resulting unemployment, and loss of usable land have detrimental effects on communities as well. The Convention on the Prohibition of the Use, Stockpiling, Production and Transfer of Anti-Personnel Mines and on Their Destruction, also known as the Ottawa Treaty, was adopted by the UN in 1997, and currently has 162 signatories. 35 United Nations States are not-party to the treaty, including the United States, Russia, and China. Terms of the treaty for signatories includes destruction of land mine stockpiles (except for a small number for training purposes), clearing of all land mine areas within the country within ten years of signing, and assistance to persons affected by land mines. The Ottawa Treaty does not include any provisions for cluster munitions, however, which can pose many of the same civilian risks as land mines. The Convention on Cluster Munitions , as a result, was adopted in 2008 and is currently signed by 116 countries. This convention is similar to the Ottawa Treaty in its obligations – destruction of stockpiles, clearing of areas, and assistance to victims. The United Nations Mine Action Service (UNMAS) is the branch of the United Nations dedicated to addressing the problem of land mines and explosive hazards. The organization works in 40 countries and three territories on different aspects of mine action, depending on the area’s need. NGOs such as the The Marshal Legacy Institute, The Halo Trust, and the Landmine Relief Fund, cover a range of actions from demining efforts to public awareness to assistance for victims. A global total of 3,308 casualties from land mines worldwide was reported, occurring in 52 states, 32 of which are state parties to the Ottawa Treaty. This number is a 24% decline from 2012’s 4,324. In 2013, Syria had the highest number of cluster munition casualties for any nation, with around 1,000 casualties, 97% of which were civilians. Casualties from cluster munition remnants occurred in nine states and one other area in 2013, including four state parties (Croatia, Iraq, Lao PDR, and Lebanon), five non-signatories (Cambodia, South Sudan, Sudan, Syria, and Vietnam), and Western Sahara. Currently, only 11 states are identified as potential producers of antipersonnel land mines: China, Cuba, India, Iran, Myanmar, North Korea, Pakistan, Russia, Singapore, South Korea, and Vietnam. The United States was removed from this list because of a 2014 policy announcement that promised an end to the production and acquisition of antipersonnel mines. The latest reports show that progress is being made in eliminating the threat of land mines and cluster munitions to civilians, but policy and practice need to continue to move towards what ICBLM calls the “international norm against use – where use anywhere by anyone is considered abhorrent.” But integrally important to the effort to reduce the threat of these deadly devices is the raising of awareness around the globe. That is the goal of events such as International Day for Mine Awareness and Assistance in Mine Action, because the more people that see and are appalled by the statistics, the stronger the pressure will be on governments worldwide to fix the problem. To find out more about land mine action, please consult the resources below! The Collaborative ORDnance data repository (CORD) enables web-based search of landmine and other unexploded ordnance data to assist humanitarian demining and ordnance disposal operations. ARCAND, J., RODELLA-BOITREAUD, A., & RIEGER, M. (2015). The Impact of Land Mines on Child Health: Evidence from Angola. Economic Development & Cultural Change, 63(2), 249-279. Kirk, R. W. (2014). In Dogs We Trust? Intersubjectivity, Response-Able Relations, and the Making of Mine Detector Dogs. Journal Of The History Of The Behavioral Sciences, 50(1), 1-36. Perez, J., Shortt, N., & Morton, J. (2012). Latin American Compliance with the Mine Ban Convention. International Journal Of Interdisciplinary Social Sciences, 6(11), 89-100. WILLIAMS J. STOP USING LAND MINES AND CLUSTER MUNITIONS. Foreign Policy [serial online]. January 2013;(198):1. Borrie, John. (2009). Unacceptable harm: a history of how the treaty to ban cluster munitions was won. New York : United Nations. Bryden, Alan. (2013). International law, politics and inhumane weapons: the effectiveness of global landmine regimes. Abingdon, Oxon : Routledge. Tyner, James A.. (2010). 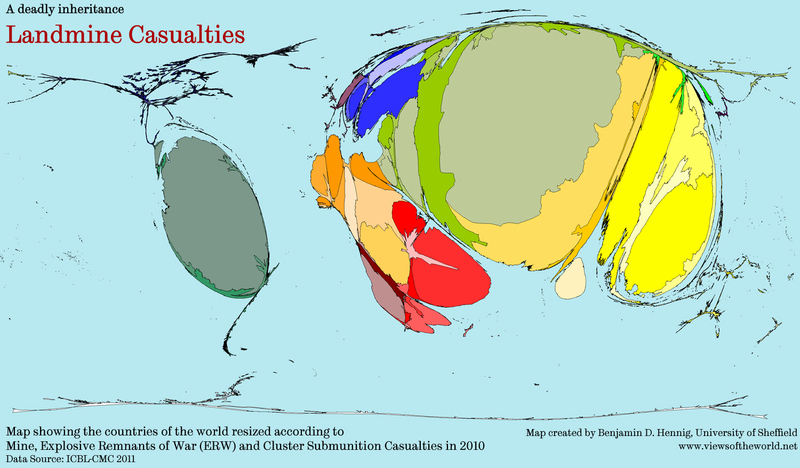 Military legacies: a world made by war. New York : Routledge. Williams, Jody, Goose, Stephen D.Wareham, Mary. (Eds.) (2008). Banning landmines :disarmament, citizen diplomacy, and human security. Lanham : Rowman & Littlefield.